Here are four folding knives that employ unusual opening mechanisms. Some knives have a “cool factor” that makes your eyes pop out. Whether sporting creative designs, spine-tingling handles and blade shapes or—in this case—ingenious mechanisms, such knives always have that special something which sets them apart. Cool can be anything from a notable mechanism to a standout design. From left: Boker Tucan, AIK Buck 112 Ranger Double-Action Auto, CRKT Daktyl and Olamic Busker Semper. Boker’s sleek Tucan would be cool on its design alone, but designer Wilfried Gorski’s innovative blade-release mechanism puts the folder over the edge. A slide release just below the oversized pivot pops the blade out of the frame so it can be opened manually, and the release also serves to deploy the blade. Simply thumb it down and the blade is ready to fold into the frame. Everything about the Tucan is upscale, from its stealthy 3-inch Bohler N690 stainless steel clip-point blade to its beautifully sculpted 3.875-inch titanium frame with carbon-fiber inlays. There is no pocket clip but no matter—the Tucan is meant for loose pocket carry. At a weight of 2.82 ounces that is not a problem. The CRKT Daktyl is a revised version of the Tom Hitchcock “Hole In One” design. Every bit as enigmatic as the original, if not more, the Daktyl has a 3.05-inch 420J2 stainless steel blade that rotates out of a 4.42-inch wire-frame handle. The fun begins trying to figure out how to release the blade via Hitchcock’s Slide Lock mechanism, which requires sliding and tipping back the thumb lever. Once you get the hang of it the Daktyl is pure fun and will amaze your friends. The modified wharncliffe blade has cutouts for lightening and a round carabiner at the base allows you to clip it to a belt loop, keychain or pack and—get this—pop a beer cap. The Daktyl has a pleasant beadblast finish overall and weighs in at 2.4 ounces. Adams International Knifeworks Buck Ranger 112 DA Auto has all the traits of the original. The 3-inch 420HC stainless steel blade whipped and sliced through paracord, 3/8-inch rappelling rope and tough waxed lasso rope with ease. 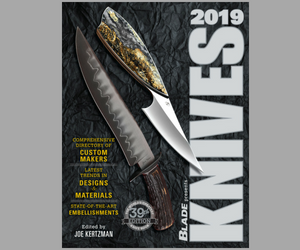 Adams International Knifeworks (AIK) has been specializing in automatics and distinctive knives since 1987, and conversions have been one of its fortes. The Buck 112 Ranger DA Auto is one such conversion and it’s a little beast. Unlike the new Buck 110 Auto, the AIK version of the smaller 112 Ranger differs in that it is a double action—opens both manually and automatically—and uses a leaf spring on the spine as opposed to a coil. The blade is employed via a flush brass button on the front, which matches the bolsters nicely. Blade deployment is via the standard lockback on the rear base. Everything else is Buck 112 Ranger, from the Dymondwood lockback grip to the 3-inch 420HC stainless steel clip-point blade and black leather belt sheath. Olamic Cutlery is known for making fashionable knives and the Busker Semper model, designed in-house, exudes coolness on every level. The folder sports curvaceous lines from stem to stern, including its ability to open 10 different ways (see above video), including a top-mounted flipper. It is a small knife—6 inches open—featuring a 2.375-inch Bohler M390 modified wharncliffe blade and a 6Al4V titanium framelock handle. Other features include a machined pocket clip, caged bearing pivot system, stainless steel lockbar insert with an over-travel stop, ceramic detent ball, and ceramic pocket clip retention ball. In a nutshell, this is the good stuff! The test model was delivered with a deep-brushed surface texture and gold anodized accents.